jetPEI®-Macrophage transfects primary macrophages, glial & dendritic cells that are considered difficult to transfect. 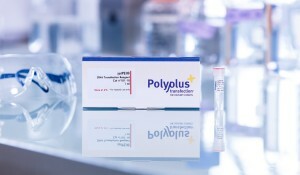 It contains a mannose-conjugated linear polyethylenimine that binds to cells expressing mannose-specific membrane receptors, such as macrophages. 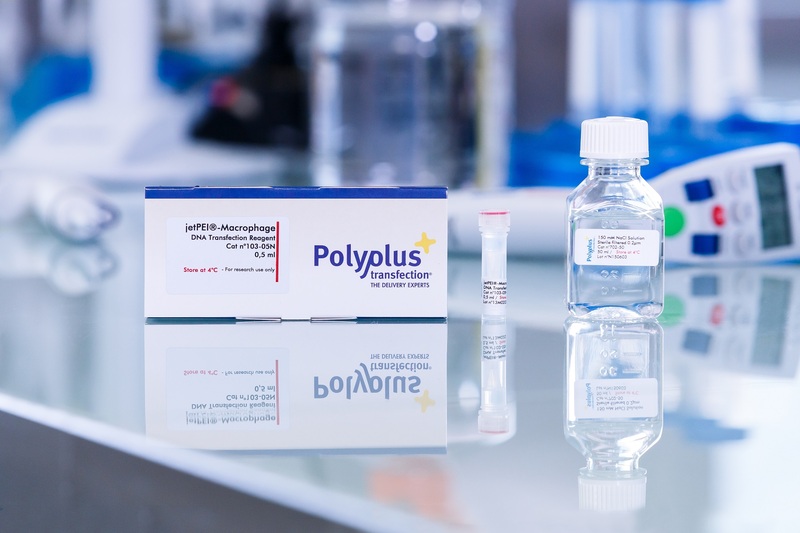 jetPEI®-Macrophage is also the reagent of choice for the transfection of cell lines such as RAW 264.7.
jetPEI®-Macrophage is a Mannose-bearing linear polyethylenimine designed to enhance the transfection of cells expressing Mannose receptors on their membrane. Cell targeting is the result of binding of the Mannose residues to the specific cell-surface receptors, leading to internalization of the DNA complexes. 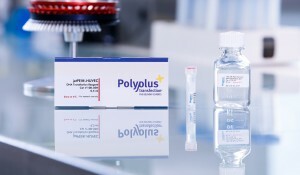 0.5 ml of jetPEI®-Macrophage transfection reagent is sufficient to perform up to 500 transfections in 24-well plates. jetPEI®-Macrophage allows successful transfection of macrophages derived from monocytes maturated for 7 days in presence of GM-CSF (Fig.1). Fig. 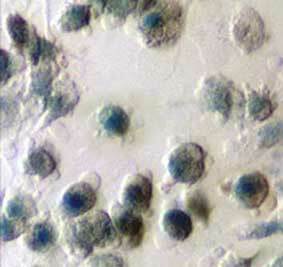 1: Transfection of human macrophages with jetPEI®-Macrophage. Human macrophages expressing Beta-Galactosidase after transfection using jetPEI®-Macrophage. Primary human macrophages and murine RAW 264.7 cells express significantly higher protein levels when transfected with jetPEI®-Macrophage (Fig. 2). Fig. 2: Comparative efficiency of jetPEI®-Macrophage versus jetPEI® on primary human macrophages and murine RAW 264.7 cells in 24-well plates. Primary human macrophages were transfected in the presence of 100 U/ml GM-CSF and 10% serum, using 1 µg pCMVLuc and 2 µl transfection reagent. Murine RAW 264.7 cells were transfected using 2 µg pCMVLuc and 6.4 µl transfection reagent. Luciferase activity was measured 24 h post-transfection. The jetPEI®-Macrophage protocol is as simple as the jetPEI® one: Mix the DNA with the reagent to form complexes and simply add the mixture to the cells. jetPEI®-Macrophage is compatible with serum and antibiotics, thus eliminating the need for media change. Protein expression is determined 24 h to 72 h post-transfection. jetPEI®-Macrophage is perfectly suited for plasmid delivery (DNA, shRNA or miRNA) to cells that express mannose-specific membrane receptors, such as primary macrophages, glial & dendritic cells. Here is a selection of relevant references using jetPEI-Macrophage®, more are available in our Polyplus-transfection Database. Markovic, D. S., Vinnakota, K., Chirasani, S., Synowitz, M., Raguet, H., Stock, K., Sliwa, M., Lehmann, S., Kalin, R., van Rooijen, N., Holmbeck, K., Heppner, F. L., Kiwit, J., Matyash, V., Lehnardt, S., Kaminska, B., Glass, R., Kettenmann, H. (2009). Gliomas induce and exploit microglial MT1-MMP expression for tumor expansion., Proc Natl Acad Sci U S A 106, 12530. Pal, R., Basu Thakur, P., Li, S., Minard, C., Rodney, G. G. (2013). Real-time imaging of NADPH oxidase activity in living cells using a novel fluorescent protein reporter., PLoS ONE 8, e6398. Wang, Y., Guo, Y., Wang, X., Huang, J., Shang, J., Sun, S. (2012). Serum amyloid P component facilitates DNA clearance and inhibits plasmid transfection: implications for human DNA vaccine., Gene Ther 19, 70-7. Aflaki, E., Doddapattar, P., Radovic, B., Povoden, S., Kolb, D., Vujic, N., Wegscheider, M., Koefeler, H., Hornemann, T., Graier, W. F., Malli, R., Madeo, F., Kratky, D. (2012). C16 ceramide is crucial for triacylglycerol-induced apoptosis in macrophages., Cell Death Dis 3, e280. Wang, D., Lou, J., Ouyang, C., Chen, W., Liu, Y., Liu, X., Cao, X., Wang, J., Lu, L. (2010). Ras-related protein Rab10 facilitates TLR4 signaling by promoting replenishment of TLR4 onto the plasma membrane., Proc Natl Acad Sci U S A 107, 13806. 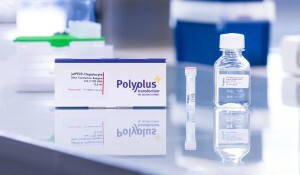 Every batch of jetPEI®-Macrophage is tested in a transfection assay. Typically, transfection of a firefly luciferase gene under the control of the CMV promote gives 109 RLU (relative light unit)/mg of protein. The value for each batch is indicated on the Certificate of Analysis.